Background reading for a new novel occasionally turns up a book that I just want to tell everyone about. The Body Keeps the Score is one such book. A surprising number of us will experience significant trauma of one kind or another in our lifetime. Yet traditional treatment has proved largely ineffective, with too many sufferers relying on emotion-blunting drugs to maintain a balance, yet remaining scarred for life. In recent years, the benefits of so-called ‘somatic therapies’, involving anything from yoga breathing exercises to neurofeedback and EMDR ‘eye training’ techniques, have cropped up in journals and ‘self-help’ books. But much of the ‘evidence’ to date has been anecdotal at best. 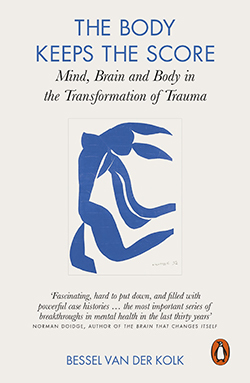 Dr van der Kolk draws on a lifetime of scientific research in trauma and neuroscience to provide an empathic, utterly absorbing and authoritative examination of trauma and its treatment. The science in The Body Keeps The Score is as uncomplicated as it can be, and using clinical cases, he illustrates the destructive influence of trauma and childhood neglect on individuals and their families. But every assertion is backed by evidence from field trials, many of which have been conducted by leading researchers in psychology, psychiatry, and trauma. He explains how technologies such as the relatively new fMRI, which can see the brain at work, together with the long-neglected quantitative EEG (qEEG), reveal how trauma affects the way different parts of the brain communicate. More excitingly, he presents strong evidence that these technologies offer new possibilities for retraining –even healing – the minds of sufferers, allowing them to leave traumatic events in the past and thrive in the present. Highly recommended.